Dominated ABA as rookie during 1969-70 season . . . Averaged 30 points and 19.5 rebounds to lead ABA in both categories . . . Also topped everyone on technical foul calls . . . "He would play in any league and be a superstar," says Knicks MVP Willis Reed . 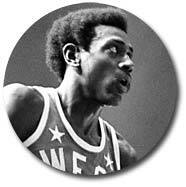 . . MVP in 1970 ABA All-Star Game when he impressed national TV audience . . . Only second rookie in pro history to score more than 2,500 points, duplicating effort by Wilt Chamberlain . 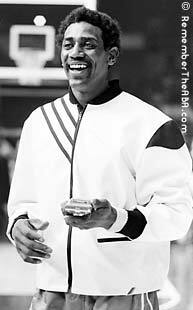 . . All-American at Detroit as sophomore, led U.S. to gold medal in 1968 Olympics right out of Trinidad Junior College . . . Signed six-year contract with Rockets for reported $1.9 million . 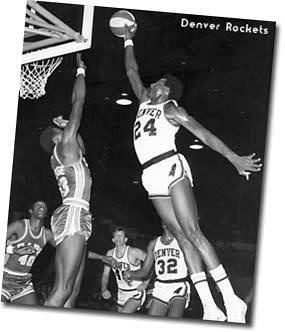 . . Center of stormy controversy during 1970-71 season after jumping from Rockets to play for NBA Seattle Supersonics . . . NBA owners argued that he wasn't eligible to play since his college class hadn't graduated (Denver signed him as a special "hardship" case) . . . Court case ending up knocking out NBA's four-year eligibility rule, a shocking development for college athletics - things will never be the same again . . . Jazz is his bag . . . So is controversy . . . Prides himself on clothing, some of which he designs himself . . . . . . Would like to do radio-television work someday . . ."In my opinion," he says, "there is no better forward than I am. But I'm not saying I'm the best." 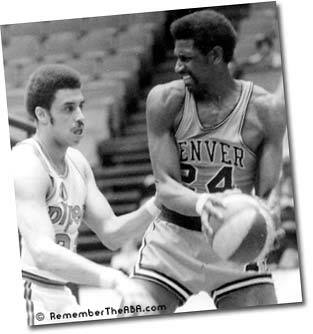 Spencer Haywood's 1969-70 season with the ABA Denver Rockets was one of the most amazing individual years in professional basketball history. 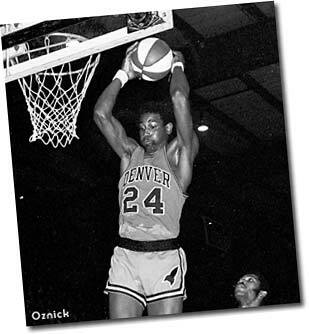 He led the ABA in scoring with 30 points per game (beating out Hall of Famer Rick Barry who averaged 27.7 for the Washington Caps). 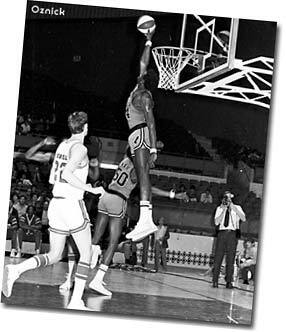 He also led the ABA in rebounding with 19.5 rebounds per game (beating out Mel Daniels who averaged 17.6 for the Pacers). 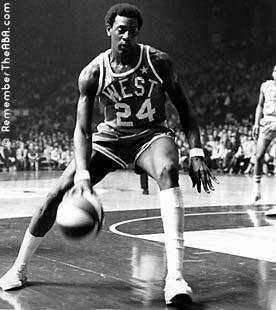 At the 1970 ABA All-Star Game held in Indianapolis and televised to a nationwide audience by CBS, Haywood was voted the game's MVP. ABA Commissioner Jack Dolph presented him with a huge MVP trophy (above middle), a 1970 Dodge Challenger ("mini" version above right), and an RCA G-2000 color television. At the end of the season, Haywood was voted the ABA Rookie of the Year, and the ABA's overall Most Valuable Player. He was also named to the first team All-ABA Team. 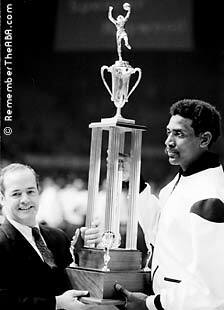 The only title Haywood did not win in his year with the Rockets was the ABA Championship, as Denver bowed out in the 2nd round of the playoffs to the "Cinderella" L.A. Stars.